THE STORY - In early-1970s Las Vegas, low-level mobster Sam "Ace" Rothstein (Robert De Niro) gets tapped by his bosses to head the Tangiers Casino. At first, he's a great success in the job, but over the years, problems with his loose-cannon enforcer Nicky Santoro (Joe Pesci), his ex-hustler wife Ginger (Sharon Stone), her con-artist ex Lester Diamond (James Woods) and a handful of corrupt politicians put Sam in ever-increasing danger. Martin Scorsese directs this adaptation of Nicholas Pileggi's book. THE GOOD - Scorsese's direction and telling of the real life events is backed by a strong performance from Robert De Niro. THE BAD - One too many comparisons to the far superior "Goodfellas" and Sharon Stone's performance can be a tad over the top at times. 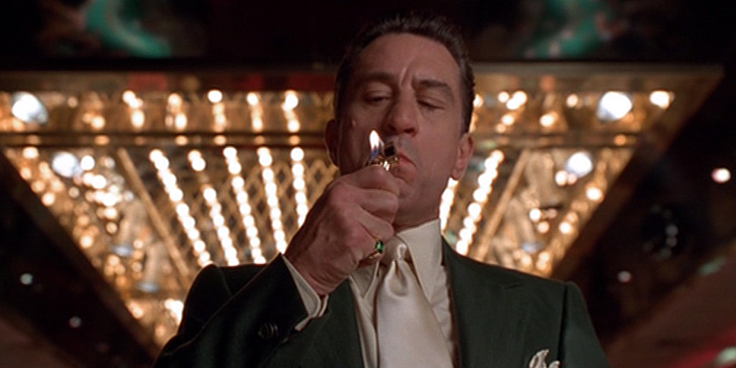 “But in the end, we f****d it all up.” That is one of the opening lines said by Nicky Santoro (Played by Joe Pesci) in director Martin Scorsese’s sprawling look at the casino life in Las Vegas during the ‘80s when it was ruled by the Chicago Outfit mob. The line tells the audience right away that this story is not going to end well for the its main characters. They’re either going to end up dead, in jail, and/or forever changed. While not as interesting nor funny as his previous collaboration with writer/author Nicholas Pileggi (1990’s “Goodfellas”), it still retains so much of the same style as “Goodfellas” that some may call this “Goodfellas” lite. Some consider the film to be superior (And yes, those people do exist). Unfortunately, I am not one of them. However, I can attest that even when Scorsese is not hitting the marker 100% of the time, he still hits it more than most in his profession. It’s 1983, and Sam “Ace” Rothstein (A game Robert De Niro) is shown in the opening moments of the film being murdered via. car explosion, while explaining to the audience (By means of voice over and believe me, there’s lots of it) about the regretful love of his life. After a dazzling opening credits sequence (With a clever homage to “Vertigo”) we are immediately thrown into the pseudo-documentary style of how the Casino was run, operated and ripped off by the mob. It’s all compelling stuff as cinematographer Robert Richarson’s camera glides from room to room in the casino showing the verisimilitude of what it must’ve been like to work behind the scenes in a large scale operation of this size. Ace is the man chosen by the mafia to manage and run the casino in its day to day operations (Despite the fact he doesn’t even have a gambling license). He’s fair, hard working, and demands nothing but perfection in order to provide the best experience to all those who come to the Tangier Outlets Casino. His childhood friend Nicky Santoro comes to Vegas to protect him in case if anyone messes with him. All seems to be going well. Then Ace eventually meets the love of his life I was alluding to before: a gold digging woman named Ginger (Played over dramatically by Sharon Stone). Once she enters into the mix, it’s all downhill from there for Ace, Nicky, the mob, and the whole operation. “Casino” has a fascinating story to tell which is why it’s so un-fascinating once the story reveals what it is truly about: self destruction. There are also themes of trust, security and loyalty. All of these are fundamental aspects that one must have to work in the mob. They are also fundamental for a stable relationship, which Ace craves, but he never has (Not once) with Ginger. She is swayed only by money and materialistic items, such as her ever expensive jewelry. Is it too simple to say money can’t buy happiness? Apparently it is for this film, as it drives this point home for three overly long hours. Ginger is a self destructive human being, who can’t stop drinking, doing lines of coke, and never puts anyone above herself (Not even her own daughter). One wonders throughout the film why Ace doesn’t just leave her knowing full well he would probably be better off and wouldn’t have to watch his whole life spiral out of control. Instead, against his own better judgment, he stays with her and continues to self destruct under the weight of the ever growing problems she presents him (One of which is an ex-boyfriend played with the right level of creepiness and charm by James Woods). Even if he had his life sorted out with Ginger, he would still have to contend with the ever volatile and self destructive Nicky, who is played in the exact same psychopathic manner that Pesci played his character Tommy DeVito in “Goodfellas.” “Casino”, with its same writer, director, lead actors, and editor is the ultimate companion piece to “Goodfellas.” However, that film was a true story of one man’s journey through the Italian Mafia from youngster wannabe to witness protection rat. This film does not see any of the characters change. Instead it watches them as they disintegrate. It’s a film all about self destruction, just as how Ace’s car in the opening moments of the film self destructs, looking to take him away with it in a blaze of glory. Scorsese remains as energetic and creative as ever in how he presents a story. From the lightning fast movements of the camera, to the stylized lighting, to the use of subtitles to explain to the audience what two people over an FBI monitored phone call really are saying, this is still a good time at the movies. While De Niro and Pesci do their best “De Niro and Pesci”, Sharon Stone is the one who will divide audiences the most. One group will believe she is giving a good tortured performance. The other group will think it’s too over the top in its emotion and hysterics. “You’re a good actress, you know that?”, Ace tells her in one scene. Is he telling her or the audience? Despite the 3 hour running time, editor Thelma Schoomaker manages to keep things moving at a frantic pace, until it comes to a screeching halt in some of the one on one dialogue scenes. The voice over disappears. The gimmicky camera tricks disappear. And instead, all we are left with is typically two actors overacting with one another some of the most dramatic scenes you will ever see. One final aspect that deserves to be touched upon in this film is the barbaric nature of the violence (Especially one scene involving baseball bats in the final act). It’s uncompromising and makes the violent acts in “Goodfellas” feel less by comparison. It may put off some viewers, but Scorsese knows it’s a necessary plot device in showcasing to the audience how much all of these characters in the end, truly f****d it all it up.